BEST PRACTICES PEER TO PEER: THE QUARTERLY MAGA ZINE OF ILTA 8 About the Author Kathleen Dunn is the Director of Learning and Professional Development at Squire Patton Boggs. She has more than 30 years of experience in organizational development and learning, coaching and talent management. Kathleen is on the Board of Directors of the Professional Development Consortium and is adjunct faculty at the Catholic University of America. Contact her at kathleen.dunn@squirepb.com. BEYOND SUMMER ASSOCIATE PROGRAMS As law firm practice management has become more complex, so has legal professional development. Legal PD practitioners have become valuable assets for their organizations by providing specialized support in several ways, including executive coaching, leadership development, knowledge management, strategic planning and organizational learning. 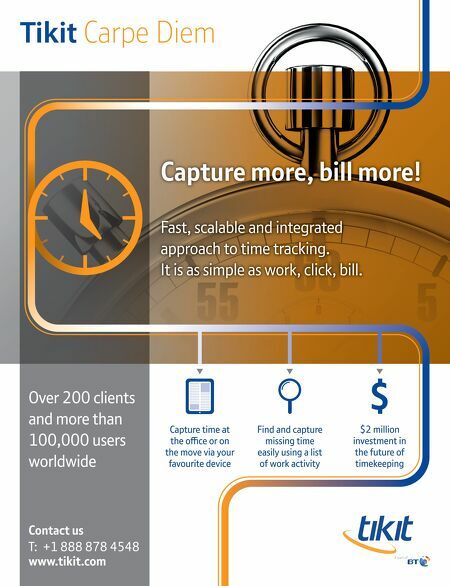 The legal profession is rapidly changing how it hires, evaluates and retains attorneys. One such change is the development and implementation of competency models and benchmarks. According to a 2009 NALP Foundation survey launched on behalf of the PDC, approximately 65 percent of responding firms reported they have already developed or are developing core competencies. Common uses reported for a competency model include professional development initiatives, recruiting, succession planning, knowledge management and talent management. 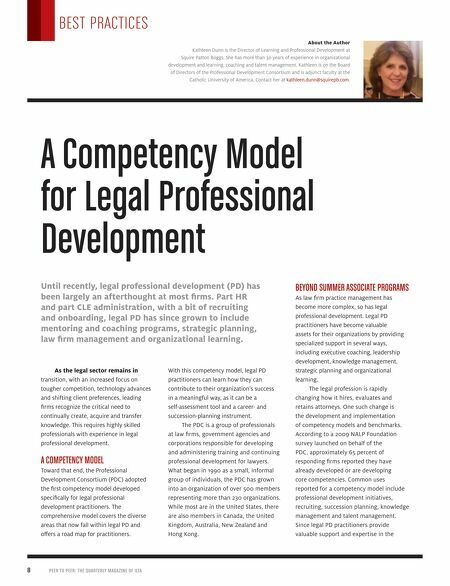 Since legal PD practitioners provide valuable support and expertise in the With this competency model, legal PD practitioners can learn how they can contribute to their organization's success in a meaningful way, as it can be a self-assessment tool and a career- and succession-planning instrument. The PDC is a group of professionals at law firms, government agencies and corporations responsible for developing and administering training and continuing professional development for lawyers. What began in 1990 as a small, informal group of individuals, the PDC has grown into an organization of over 500 members representing more than 230 organizations. While most are in the United States, there are also members in Canada, the United Kingdom, Australia, New Zealand and Hong Kong. As the legal sector remains in transition, with an increased focus on tougher competition, technology advances and shifting client preferences, leading firms recognize the critical need to continually create, acquire and transfer knowledge. This requires highly skilled professionals with experience in legal professional development. A COMPETENCY MODEL Toward that end, the Professional Development Consortium (PDC) adopted the first competency model developed specifically for legal professional development practitioners. The comprehensive model covers the diverse areas that now fall within legal PD and offers a road map for practitioners. A Competency Model for Legal Professional Development Until recently, legal professional development (PD) has been largely an afterthought at most firms. Part HR and part CLE administration, with a bit of recruiting and onboarding, legal PD has since grown to include mentoring and coaching programs, strategic planning, law firm management and organizational learning. Who Are "Tomorrow's Lawyers," and How Can We Help Them?